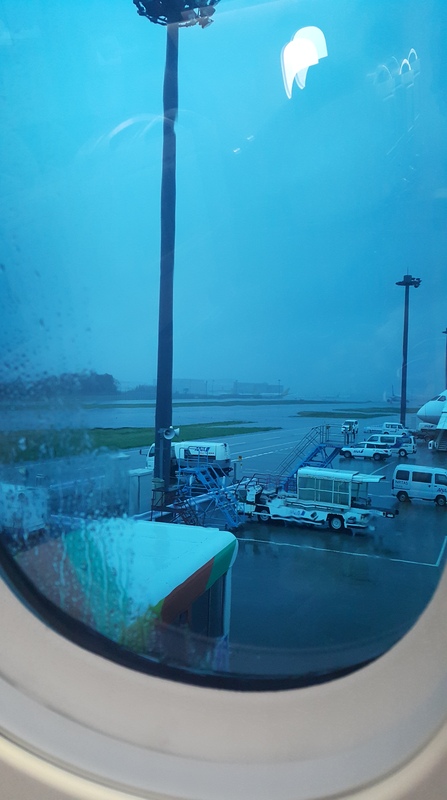 We’re finally at the last part of my Japan 2019 adventure! (Click here to read part 1, part 2, and part 3.) It was so much fun writing and editing all the photos (all 140+ photos)—it’s as if I’m traveling back there again through my writing. I hope you guys enjoyed reading this as much as I did writing it! The bus conveniently announcing our arrival. We got seats on the ferry that face the windows! What’s cool about this ferry is that it cruises slowly on the river, letting us enjoy the calm views, before speeding into the sea! Trying hard to blend in? After saying hello to the deer, we spotted our first eat of the afternoon: curry oyster buns! Man, I love oysters and curry, and to see the two of them combined into one heavenly pouch made me really excited. I immediately bought one with no hesitation. The verdict? I would gladly go all the way back to Miyajima just to eat another one of these. Delicious! Last I left from the previous blog post, my friends and I were in Osaka getting ready to go to Kyoto. We woke up to a slow morning and eventually made our way to Kyoto from Osaka via the express train. Luckily, our hostel, Kyoto Hana Hostel, was within walking distance from Kyoto Station, so (after a quick stop at the Kyoto main post office) we dropped off our luggage right away and headed to Nishiki Market for a late lunch/street-food-food-trip. I got this large unagi sushi for ¥300! Yum. After practically inhaling the unagi, we walked for about twenty steps when I found the next thing to eat: tofu doughnuts! Six tofu doughnuts for ¥300! I can’t recall what this is exactly, but it’s like a pork pancake? Moving on in the market, we unexpectedly found a Snoopy Chaya branch! I’m not a big fan of matcha (oops) but I AM a big Peanuts/Snoopy fan, so I went in and looked around. Happy kid! I also bought a few souvenirs here, hehe. Look at that Snoopy mochi! So cute! Anyways, back to Kyoto! We waited outside the restaurant early and was able to get the counter seats (we were the second group to be seated), which is a big deal for me as the restaurant alone could only seat eight people at a time. So honored and happy to sit right across from Chef Motokichi Yukimura! One night bus later, we arrived at Osaka! This marked my third time to visit Osaka, and every time I go back, it brings me warm memories. It’s the place where I visited Japan for the first time, after all! Every time I go back, I feel bubbly and excited—there’s just so much to do and see! The hot milk tea and warm cheeseburger definitely hit the spot! After breakfast, we walked back to the hostel and freshened up for the day. This day was a free day dedicated to shopping and exploring; we didn’t have a fixed schedule, so it was nice to just take the city in. We walked to Dotonburi and enjoyed exploring the shops in the area. Eventually, with all the walking we did, our stomachs went empty once more and we decided that lunch would be a little “treat yo’ self” meal and headed to Daimaru. So. Good. Everything was cooked to perfection—almost like a melt-in-your-mouth experience! I’ve been working on my high school yearbook as the editor-in-chief for four years already (there were a lot of complications) and it’s finally ready for distribution! July 2 was a memorable day for me, for sure. We finally decided the names of our puppies: Pepper and Oreo! Two back-to-back events: an ABC book launch and a spoken word poetry show by Phil Kaye and Sarah Kay! Hello, everyone! It’s been quite a while. I have a few pending blog posts I’d like to share here—and I will soon! I just finished my thesis (yes!) and am currently waiting for my defense at the end of the month, which means I have more time to write, yey! A few weeks ago, I headed to Singapore (my first time!) for a brief 3-day trip. 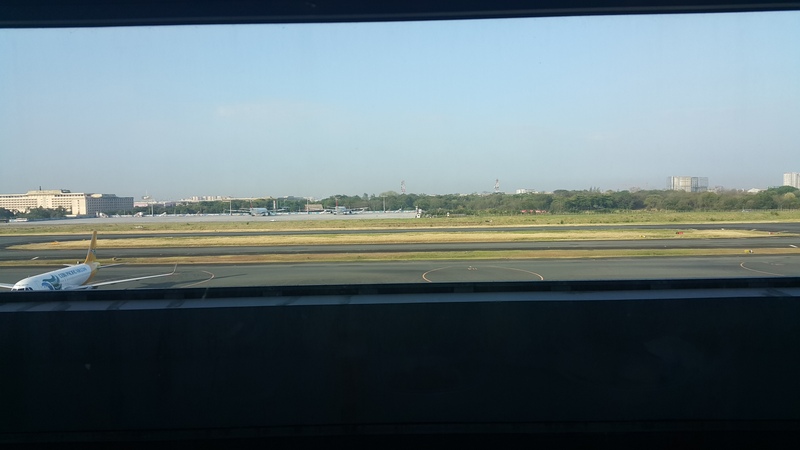 It was mostly a business trip (plus a little leisure) and I was in the middle of making my thesis (more on this in a separate post) so I was feeling anxious before the trip, thinking about the workload I can’t do while I’m there. Later on, I realized that a 3-day break was just what I needed. Before the trip, I was painting non-stop (my thesis is a children’s book which I wrote and illustrated.) Sometimes, the most difficult thing about working is knowing when to take a break. The entire flight was pleasant, the airplane food was good, and the in-flight entertainment? Wonderful! Fast forward to a couple more hours later, we’ve finally landed in Singapore! Right away, I’m impressed by Changi Airport—I could see why it’s one of the best in the world. As soon as we got out of the airport, we booked a Grab and headed for our rented apartment. While waiting for check-in, we had lunch at the hawker center across the street. I finally got to try a long-time curiosity of mine: carrot cake! After lunch, we checked-in our apartment and headed for Office Expo Asia, where we spent the rest of the afternoon. The expo was interesting—there were a lot of products that surely intrigued me. I dropped by Tower Records and knew immediately what I’m looking for—to my delight, I was able to find them! I grabbed a copy of Panic! at the Disco’s Death of a Bachelor (I’ve been looking for a physical copy for a looong time; I love this album so much) and Lin-Manuel Miranda’s Hamilton (I am a total theatre nerd and I am proud Hamitrash—I think I’ve memorized at least more than half the songs so far? Hehehe.) Great finds + great buys! Next up, I bought these sticker organizers. I really had this one my ‘to-buy’ list and luckily didn’t have too much of a hard time finding them. …while the red one is for vertical sticker sheets! A few days ago, my family and I went to Osaka, Japan. We stayed there from June 7 to 11, 2018—too short of a stay, if you’d ask me! Hehe. For this trip, I booked EVA Air (a 4AM-12nn flight, with a layover at Taipei for two hours.) I booked this trip months ahead and excitedly counted the days ’till the big trip; I was especially excited for this trip because it would be my little sister’s first time in Japan! Sunrise up in the sky! We rode to Namba in comfortable peace and enjoyed the sights. Forty-five minutes later, we got to our destination. The train looks so cool + futuristic, hehe. Would recommend riding the rapi:t train (you can purchase roundtrip tickets!) If you book it online or buy the tickets there, you can get reserved seating. We made our way to our hotel, Ibis Styles Osaka, dropped our things off, and headed for Osaka Aquarium Kaiyukan! If you squint, you could see my dad, my mom, and my sister photobombing my photo. Huhu. Bangkok 2017 (Seeding the Future ASEAN Camp)! Now, some backstory on this post. Two years ago, I submitted my application for PTT’s Seeding the Future ASEAN Camp and I didn’t get accepted. Not giving up, I tried out again this year with my best friend, Courtney (this is the first time the camp accepted applications by the pair!) After tensely waiting for weeks, we got the big news: we got accepted to the ASEAN Camp! Everything after that happened really fast—we met up with the other pairs who were picked as well, had a send-off party from the company, and packed for our trip! Team PH from batch 2017 and earlier batches + admins of PTT! The camp was held from November 19 to 24—yes, I didn’t go to classes for a week (excused, though.) Courtney slept over the night before our flight and we headed for the airport in the wee hours of the morning. We were really excited for several reasons: it was our first official trip abroad together, we were excited to meet new people, we were excited to learn new things, and we were excited to visit Thailand for the first time! The morning of our departure! BTS of our documenting everything, ha-ha! We met up with other PTT pairs, too! A few hours later, we were comfortably checked in our hotel and had some free time to lounge about before our first general assembly with the entire camp. With so many activities and getting-to-know-you games, I can confidently say that it was a night to remember. I met a lot of wonderful people (despite my introvert-self working double time memorizing everyone’s face + name, haha!) We even met another fellow Filipino who was based in Thailand (Mike!) After an overwhelming welcome from PTT and the entire camp (not to mention the memory game we had to play by memorizing everyone’s name—which I completely messed up huhu), we tucked in for the night, excited what the next few days would bring us. After 8 months, I’m extremely lucky enough to go back to Tokyo, Japan! I was in charge of creating the itinerary and planning other details alongside my aunt – which was a really exciting and awesome responsibility!I was looking forward to this trip for several months – it’s what kept me going in school (“suffer now, enjoy later”) as I spent fewer hours sleeping and more hours into school work. Like my previous travel/ Japan posts (click here to read one), I’ll break down my trip per day. 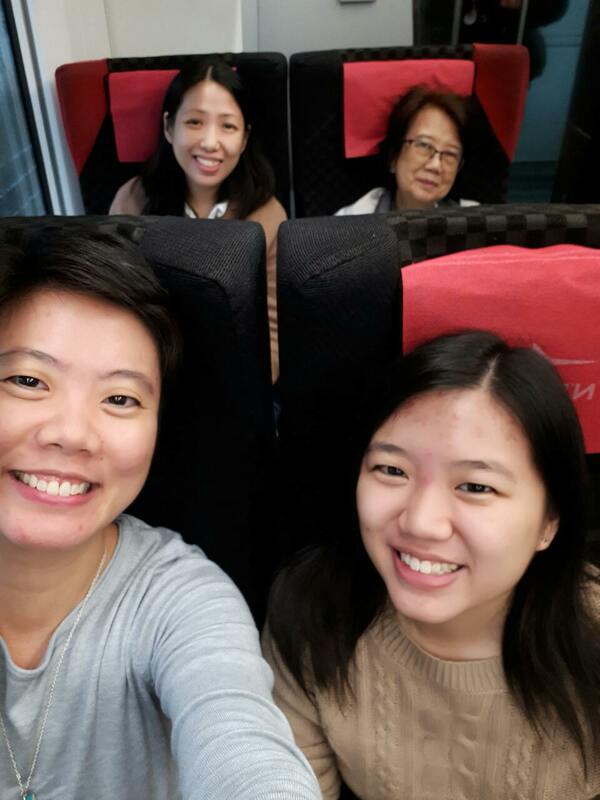 For this trip, I went with my grandmother and my two aunts! Our flight to Tokyo, Japan leaves at 9AM, so my family and I were at the airport by 5:30AM. After dropping our bags off, we headed for the airport lounge for a light breakfast (since they’ll also be serving brunch on the plane later on) as we waited for our boarding time. I was itching to leave since at this time of the year, it’s really hot here in the Philippines and I’m missing the cool air of Spring. Fast forward to four hours, we finally landed! I was immediately hit with nostalgia when I saw all the Japanese characters all around and when I heard “arigatou gozaimasu” from the usual “thank you” and “salamat” I hear at home. I was grinning from ear to ear as we made our way to the Narita Express to catch a train to Shibuya.